Exfoliating toners are one of the latest "things" in the skincare world, and a recent discovery for me (thanks to my skincare guru, the utterly fabulous @CarolineHirons; what this woman doesn't know about skincare ain't worth knowing). The more I researched them, the more intrigued I became, until there was nothing else for it, I had to try one out for myself. 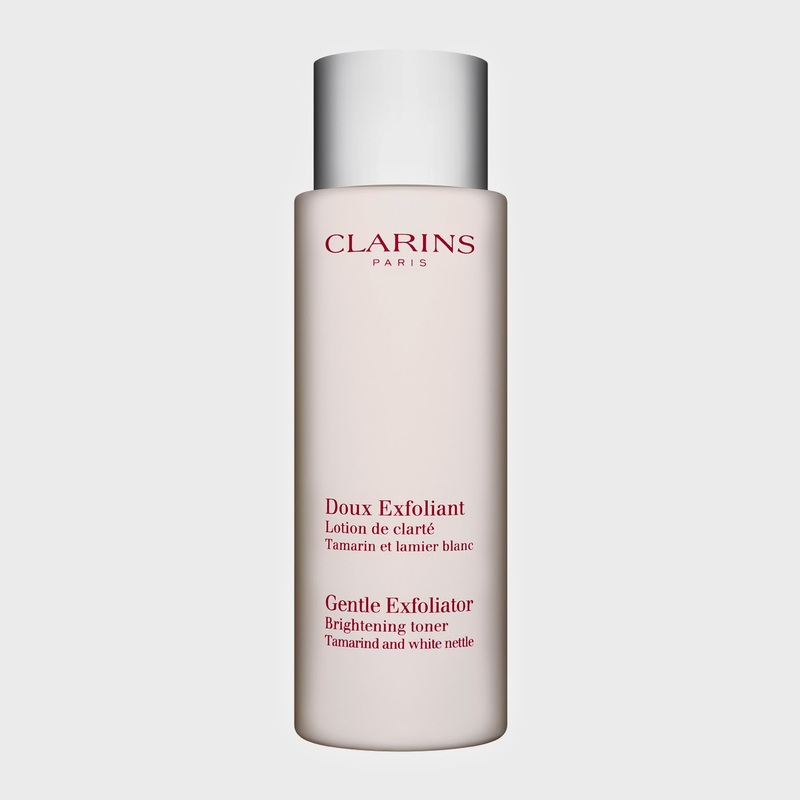 The one I decided to try was the Clarins Gentle Exfoliator Brightening Toner. So what is it, exactly? It's a toning fluid, that you use immediately after cleansing and before the next step of your skincare routine, in the same way as any toner, however it also contains some AHA and BHAs to exfoliate the skin (look here for more info). The Clarins SA recommended that I use this once a week, in addition to, and not instead of, my usual mechanical wash-off exfoliator. The fluid itself is a lot thicker than I was expecting - instead of a more usual watery-toner, this is more gel-like in texture. To use it, cleanse as per normal and then soak a cotton pad in the toner and rub it in all over your face. Given the ingredients, you should avoid your eye area. Wait around a minute before continuing to allow it to dry in, and then continue as normal (eye cream, serums, moisturisers etc). This makes sense; AHAs and BHAs work better if they're allowed to sit on your skin, as opposed to washing them off immediately. Before deciding on which product to try out, I had done a lot of research on exfoliating toners in general, and this particular one from Clarins engenders much online love. One of the main things that I noted from other reviewers' posts was how gentle this product is and that it can be used more than the recommended once-a-week - so I decided to test the theory and I can also attest to this; I've been using this about every other day, and have had no adverse reactions (and I have pretty sensitive skin). I've noticed a definite improvement in the texture of my skin, and it definitely looks brighter and fresher with continued usage. Personally I wouldn't use this on a daily basis, mainly because I still use a mechanical exfoliator once or twice a week anyhow. I use this as part of my night time skincare routine because I have a little more time in the evenings and because usually anything containing AHAs or BHAs can increase your skin's sensitivity to the sun (and I'm already extremely pale and don't want to get burned, thank you very much). In a nutshell, I really like this product - I'm seriously impressed with the results right from the first use. I'm heading into week three with my 30ml sample and it's still going strong, which means the full size (125ml, which costs €31) would last you for months and months. I highly recommend this a gentle foray into and AHA/BHA exfoliator, if you're not already using one.